Reach 1: Haynesville Brook-Hardwick (4 miles) Above Hardwick, the river is a white-water river only navigable in the spring’s high water. The most common launch point ison a tributary, Haynes Brook, near the intersection of Rt 15 and 16. There are a series of Class II and III rapids in this reach that require skills to navigate. Reach 2: Hardwick Lake Lake To Fisher Bridge (three miles): The river here is flatwater. While often close to Rt 15, it is a good option for paddlers seeking a short trip near the river’s headwaters. Reach 3:Elmore Pond Rd to Morrisville Oxbow Park (8 miles): This is a varied and interesting section through a rural valley, with occasional “rock gardens” that require attention. While Rt 15 is never far, paddling is still pleasant. Reach 4: Cadyville Falls to Watermen Brook (5 miles): The river here is quiet, remove, scenic, and offers great trout fishing. 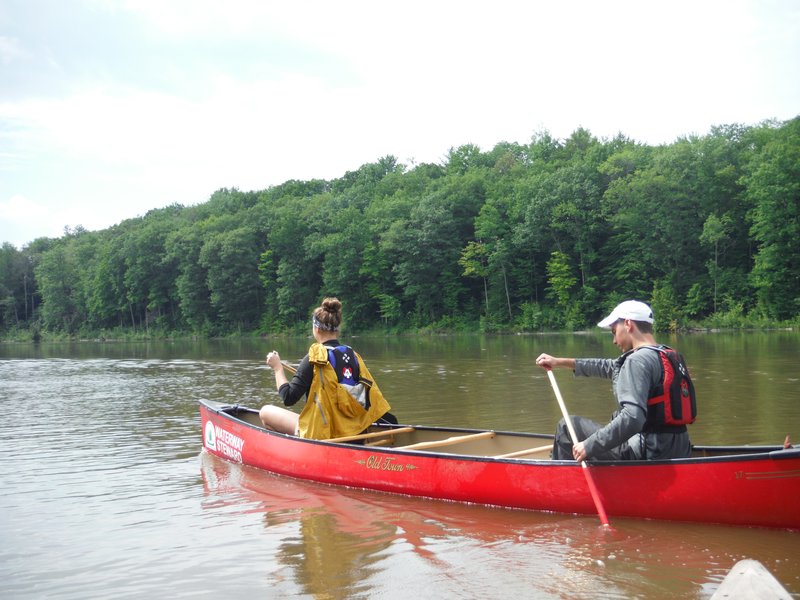 For a longer paddle (1o miles), continue on to visit (and portage) scenic Dog Head and Sloping Falls before taking out by the Rt 15A bridge below Johnson. Reach 5: Johnson to Jeffersonville (12 miles): This reach is marked by scenic Ithiel Falls (Class II) and a broad agricultural valley with sweeping views, and some great swimming spots. Reach 7: Fairfax Falls to Arrowhead Lake: (Eight miles): This is a great open boat run for paddlers looking for easy-moderate whitewater suitable for open boats in a beautiful valley away from busy roads. Arrowhead Lake (2-8 miles): Arrowhead Lake’s 8.8 miles of shoreline provide hours of flatwater paddling. Watch for ospreys, swallows, ducks, red wing blackburds, and snapping turles in the marshy areas in the lake’s northern end. Milton to Lake Champlain: (10 miles): The Lamoille river delta is quiet water passing through scenic gorges and wetlands before emptying in Lake Champlain. Peterson Dam must be portaged. Day one (5-10 miles): For a short trip, put in below Cadyville Falls. It is a five mile (2 hr) paddle through the “Ten Bends” region to the Tettor Totter Campsite, constructed in the summer of 2015. The river here is quiet, remove, scenic, and offers great trout fishing. Stop along the way at sandbanks to swim. Those seeking a full first day (15 miles. 4-6 hrs) can put in as high up as Elmore Pond Rd. in Wolcott. Tettor Totter campsite has room for approximately four tents, and can get overgrown in the summer. Day two (7-14 miles): Visits to (and portages) at Dog Head Falls and Sloping Falls, as well as a run of Ithiel Falls add variety to your trip – but pack accordingly, and be aware of your location on the river! A variety of take-outs are possible. Those seeking a 1/2 day paddle should take out by Willow’s Crossing (7 miles, 3-4 hrs). For a full day, takeout in Jeffersonville for a 14 mile day.